Originally the guilds appear to have been associations giving mutual protection to their members, as long as royal power was weak and the judical systems did not function. They all had a deep religious stamp and gave the members solidarity. Most of the Canute guilds had duke Canute Lavard as their original patron saint; he had been canonised by the Pope in 1169 and they probably originated during the period 1170 and up to 1250. The history of Malmö´s Saint Canute guild can be found in a very well preserved archive. The oldest charter is dated 1256 and minutes from 1680. We don´t know when the guild started but its patron was both Canute Lavard and during the 14th century his uncle king Canute (Knut IV Svendsen). The guild was closely connected to Malmö´s mayor and council, so close that there was a dispute when in the 1730s, the brothers chose the county governor as Master (ålderman) instead of the mayor. The Malmö county governors then continued to be masters of the guild up to 1999. The ceremonies at the functions are an important component, and present ceremonies, summed by the the chimes of Canute´s bell, are solemnised in the St. Peter´s church, processions, receptions and polonaises stem from old traditions.The dove, which is pinned to each recipient´s breast, has been in existence for 250 years. Very old treasures also belong to the festive occasions, the 16th century dove on the ceiling as a sign of peace and concord and the silvergoblets (during the rest of the year all treasures can be seen at the Malmö museum). Originally the guild had its own guildhall, but when the city hall was completed at Stortorget Square in 1546, Canute´s guild soon moved in. The guild looked after its Canutes´hall and kept it in good repair until the town hall was rebuilt and the City of Malmö took over that responsibility in 1865. The hall with gold décor and mirrors is still called Canute´s Hall. The guilds lost power and property in connection with the reformation and all guilds apart from those of Malmö, Lund and Ystad vanished. Later generations have, however, shown an interest in reviving them and at present there are nine Swedish guilds, one in Denmark and a Danish guild in Flensborg in Germany. Today the Malmö guild has about 330 members and every second year in March there is a ceremonial gathering (Högtidssammankomst), every year in the spring the ”parrot” is shooted with bow and arrow, a dinner with amusement is arranged around St Morten´s day in November and there are also other activities. The membership fee is 150 SEK/person and for reception 200 SEK. 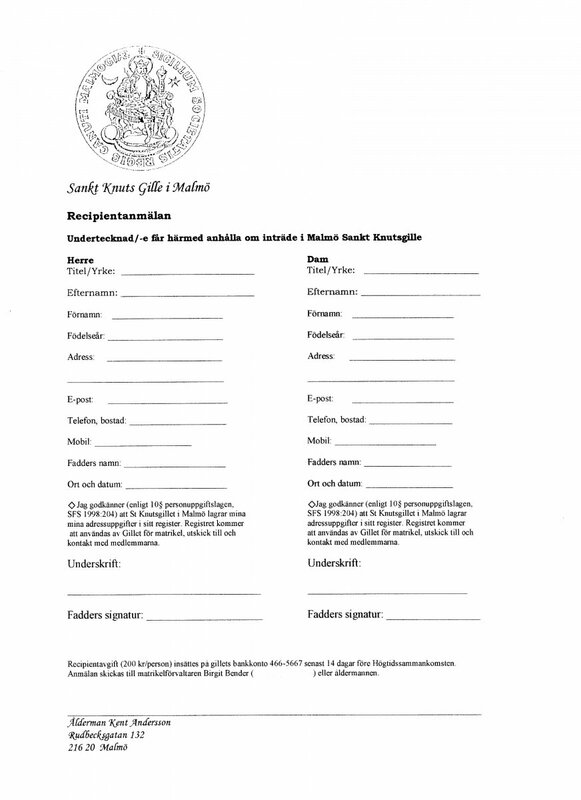 Membership can be applayed by filling in a form and be sent to the guild, address: ålderman Kent Andersson, Rudbecksgatan 132, 216 20 Malmö, e-mail: kent.andersson@malmo.se.